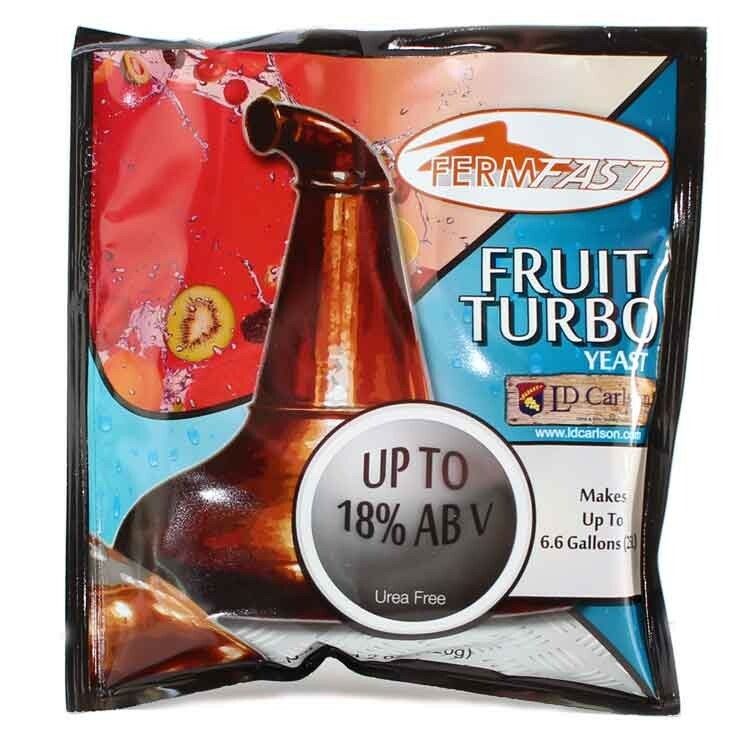 FERMFAST FRUIT TURBO YEAST 120 GRAM - Texas Brewing Inc.
least 50% of the sugar content comes from fruit. Do not use with 100% sugar solution. Turbo Yeast (UF) – Makes up to Declared Pack Weight: 120g e BBE: 24 Months Ingredient Declarations: Yeast, yeast nutrient, antifoam, vitamins, trace minerals. Allergen Declarations: None 6 Gallons Applications: Used to ferment all-fruit or fruit-sugar mixes up to 18% ABV. Best results are achieved when at least 50% of the sugar content comes from fruit. Do not use with 100% sugar solution. Please note: when using fruit, treatment with pectinase enzyme may be required to remove haze-causing pectin if the fermented wash is to be consumed without distillation. Directions: Once all-fruit or fruit-sugar mash is prepared allow to cool to 86ºF (30°C). Add the Fruit Turbo Yeast sachet contents and stir well. Secure lid firmly onto fermenter, attach airlock and leave to ferment between 68-86ºF (20-30°C) until fermentation is complete (approximately 7-10 days).